In 1944, General MacArthur sent a telegram to the Army football team congratulating them on their big win against Navy. It read, “The greatest of all Army teams. We have stopped the war to celebrate your magnificent success.” It was during these years that General MacArthur became enamored with the kind of men that were fighting for him during World War II. He noticed that the men who fought for him, who garnered his respect, often came from Army. Three years later in 1947, General MacArthur founded the NFF with the help of Earl Blaik, the famous Army football coach, and Grantland Rice, the sportswriter who coined the famous Notre Dame backfield “The Four Horsemen.” The three of them would create the NFF, the College Football Hall of Fame and their very own national championship trophy, the MacArthur Bowl. It wasn’t until 1959 that the MacArthur Bowl would be presented to a national champion with the first winner being Syracuse. Since then it has been given out 57 times with the Alabama Crimson Tide winning it the most, with eight. USC and Notre Dame have been awarded the trophy five times each. In total, 24 different teams have been awarded the MacArthur Bowl. 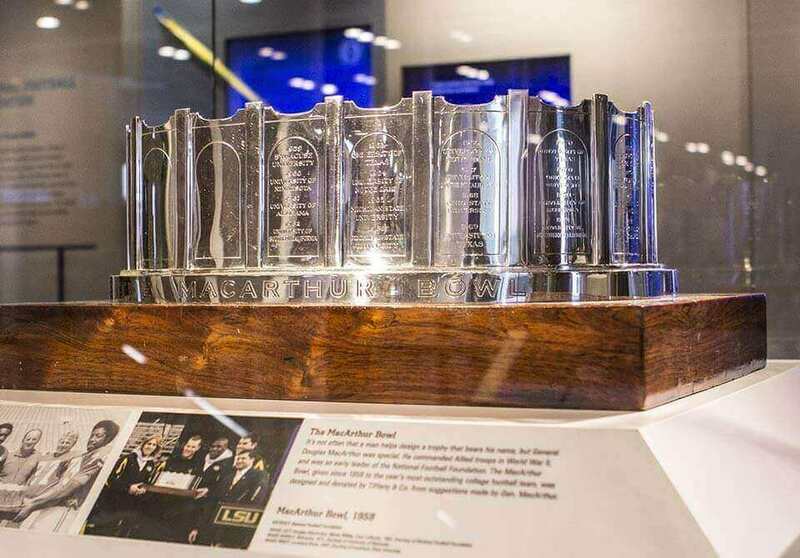 These national champions are etched into the outer edge of the trophy, and with the exception of two years (1966 and 1970), there is only one MacArthur Bowl winner each year. The emergence of the College Football Playoff has assured that there will be no more debates as to who the national champion is. It hasn’t always been so easy to determine the winner of the trophy. In previous years, there was much debate including 1997 when Michigan and Nebraska were both named national champions. Michigan was named the AP Poll national champion while Nebraska was named the national champion in the Coaches Poll. That year the NFF Awards and MacArthur Bowl Committees awarded the MacArthur Bowl to the Michigan Wolverines. The MacArthur Bowl’s permanent home is the Chick-fil-A College Football Hall of Fame. This priceless artifact leaves its protective case only twice a year. Once when it is being inscribed with the new national champion and again when it is presented in a ceremony at the Hall to the winning team. The current winner of the trophy are the Alabama Crimson Tide, led by Head Coach Nick Saban. The Alabama Crimson Tide beat the Georgia Bulldogs 26-23 on January 8, 2018, to win the national championship. Congratulations to the Clemson Tigers and their fans on winning the MacArthur Bowl and an amazing 2018-2019 season.